All eyes are watching Japan to see if Prime Minister Shinzo Abe’s policies can effectively lower the price of Japanese exports and help to kick-start the island nation’s economy. Across the asset management industry, thought leaders are focusing their attention on this hot global investing topic. AllianceBernstein posted two Japan-related commentaries: Are Global Concerns About the Yen Overdone? And Should Euro-Area Exporters Worry About a Weaker Yen? Both of these commentaries analyze the impact that Abenonics should have on external trade, particularly with the Eurozone. 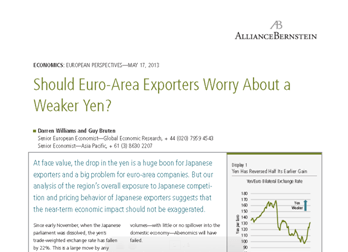 AllianceBernstein asserts that while the Yen’s depreciation may impact companies in direct competition with Japanese firms, the relatively small percentage of Eurozone trade that Japan represents should dampen the policy’s impact on the region. Federated posted a streaming video, Japan Stimulates Interest, explaining the “three arrows” approach of Abenomics aimed at lowering the value of the Yen and increasing the competitiveness of the nation’s exports. 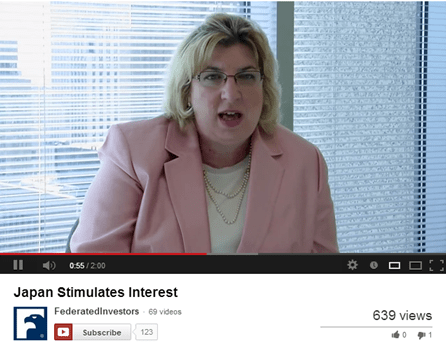 Federated’s Senior Portfolio Manager Audrey Kaplan notes that this creates investment opportunities in the nation. Later in the month, Ms. Kaplan noted that the nation’s economy began showing signs of improvement with job listings up and improving GDP figures. 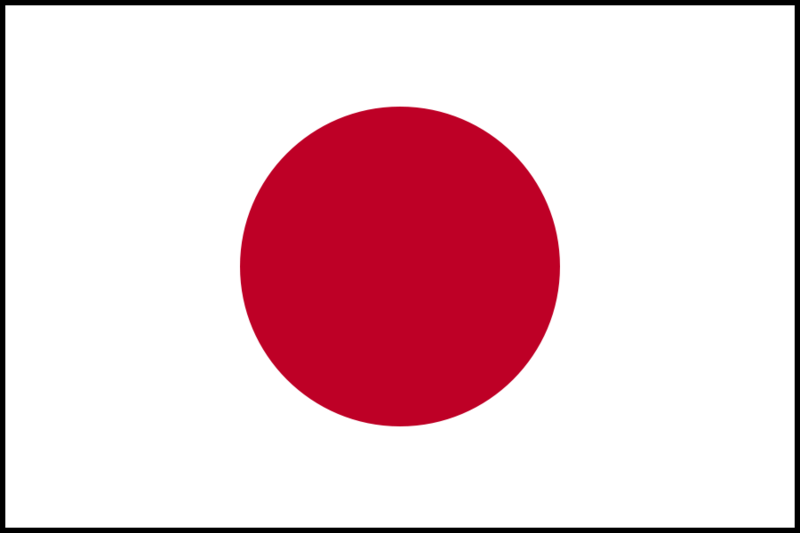 J.P. Morgan posted a commentary in May from thought leaders Dr. David Kelly and Yoshinori Shigemi titled Japan: Is this a Hiccup? that analyzes a drop in Japanese stocks. The firm asserts that the drop represents a correction and that Abenomics has the potential to move Japan’s economy out of its downward spiral and back into growth. The authors recommend that investors remain diversified to limit the impact of corrections. Lord Abbett’s Milton Ezrati recently composed a new Economic Insights piece, Japan: Gauging the Stimulus Response, which states that major structural challenges such as debt and demographics may stand in the way of future growth. Nevertheless, the firm concedes that markets are responding well to the infusion of spending and monetary easing. 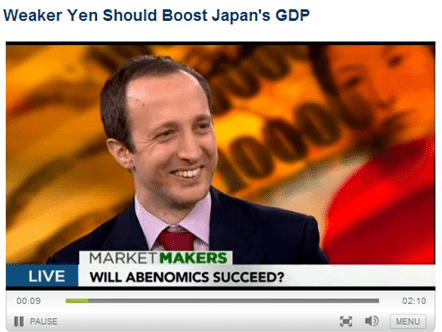 In May, Oppenheimer’s Alessio de Longis offered the firm’s views of quantitative easing on the Yen in a video piece. Mr. de Longis predicted that the pace of weakening will become more gradual, and that Mr. Kuroda of the BoJ will have the fortitude to see through the proposed devaluations.